The nondescript bar is a fascinating library of fine whiskey. 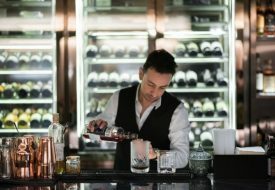 At Flagship, you won’t find fancy schmancy cocktails with exotic, unusual flavours or excessive garnishing that distracts the tipple from its sole purpose — to quench and soothe the soul. Newly branded as the home of the Old Fashioned, the latest establishment from the award-winning Jigger & Pony family, wants you to go back to basics. 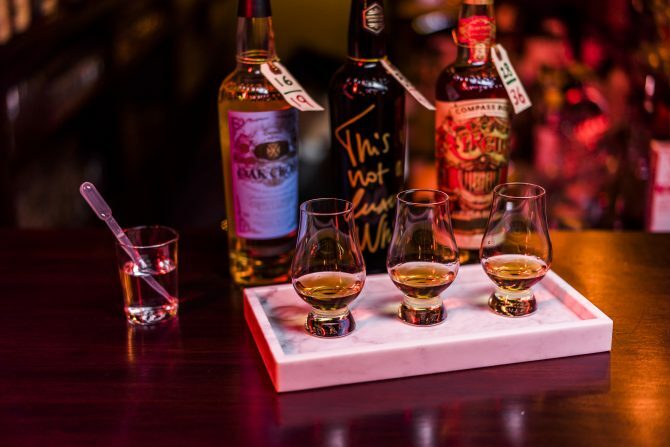 Try the whiskey flights to discover new flavours. Situated at the end of a cosy alleyway right beside small plate seafood restaurant Humpback, the nondescript bar is a fascinating library of fine whiskey. Bottles of whiskey that hail from around the world — more than 180, we heard — line the wall, each one neatly labeled with a old-school brown tag. There’s a seductive charm to this hideaway, that almost makes us want to engage in a whiskey-induced illicit affair of sorts. And so we did, plunging straight in with the Westland American Single Malt ($24). Ranking among the best American single malt whiskeys, this scotch-like whiskey offers distinct notes of ripe fruits, cherry and just a hint of coffee. Next, principal bartender Jerrold Khoo spiced things up by offering us the Compass Box Oak Cross ($19). The complex tasting whiskey, aged in both American and new French oak casks, offers a light yet bold aroma. Honey sweetness soon mellows into a lingering spice, which complemented the creamy Smoke Salmon Dip ($15) nicely. 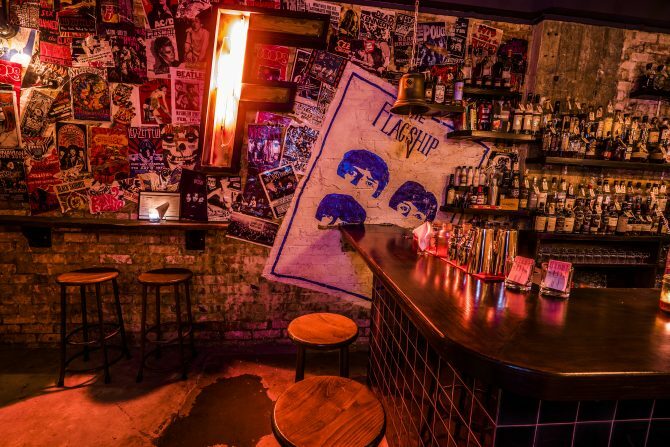 Even if you have your go-to tipple, adventure is always encouraged at Flagship. Case in point? The Amrut Fusion ($22), an interesting, spice-forward single malt Indian whiskey made with a blend of Indian barley from Punjab and peated Scottish barley. With whiskeys at the heart of Flagship, there’s no better way to show them off than with an Old Fashioned. With whiskeys at the heart of Flagship, there’s no better way to show them off than with an Old Fashioned. 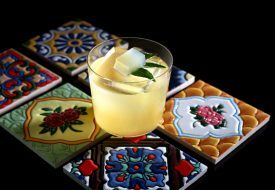 The fairly simple yet democratic libation is brought to new heights with four variations on the menu. 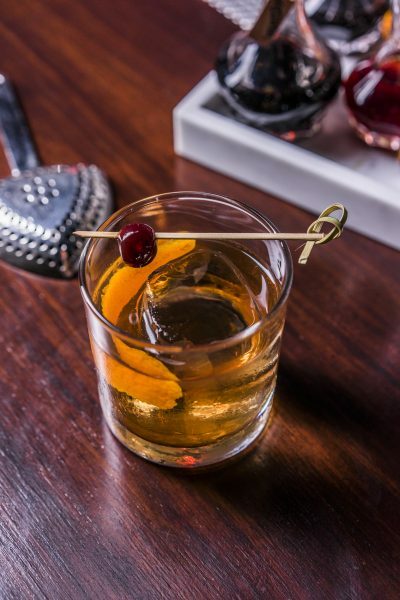 We recommend starting with the Classic Old Fashioned ($22), a standard bearer that pays homage to the cocktail’s rye heritage with the Bulleit Bourbon. Woody, spicy, with the unmistakable sweetness from the bourbon, this one deserves a spot in any Old Fashioned lover’s list. A close second is the Wine of the South ($22), an alcoholic spin on the sweet peach tea. Crafted with Michter’s Small Batch Bourbon, mint, 15 black tea syrup, peach bitters; it is easy on the palate and refreshing. For a treat, order the Apple Tree ($22), a fruity and aromatic concoction with a harmonious blend of rich rye whisky, apple bitters and cinnamon sugar. But if a stiff drink’s what you’re after, the Sherry Cask Old Fashioned ($22), with its punchy aged bitters and complex Glendronach 12 Year Old Single Malt Scotch, will not disappoint. 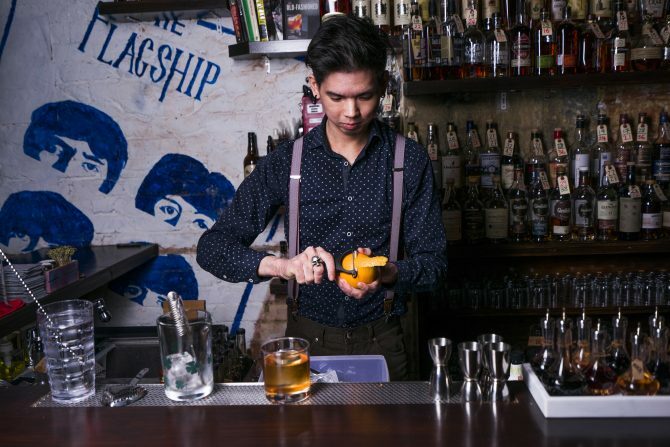 Jerrold can transform any whisky, gin or rum into an Old Fashioned with a twist at no extra charge. Drink connoisseurs will also be pleased that Jerrold can transform any whisky, gin or rum into an Old Fashioned (from $22) with a twist at no extra charge. We reckon this will be a good time to venture out of your comfort zone and pick from their wide variety of whiskies. For the best experience, go ahead and order bar grub like their legendary Pok Pok Chicken Wings ($16). Greasy, crunchy and garlicky, it’s everything we want in a post-drink snack. The Classic Old Fashioned ($22) will be available for 1-for-1 from now till end Oct 2016.